Where Colesville Road (Route 29) passes between Indian Spring and North Hills of Sligo, it's a six-lane divided highway, but residents need to be able to cross the street on foot to access homes and businesses. The crosswalk at the intersection of Colesville Road and Indain Spring Drive is the most efficient way to do so, but it is not safe. Unfortunately, Four Corners resident Joe Fox found out first hand how dangerous this crosswalk really is. The crosswalk. All photos by the author. Ever crossed the Beltway using University Boulevard? If you have, you've probably seen some of the oldest road signs in the D.C. area that are still in use. 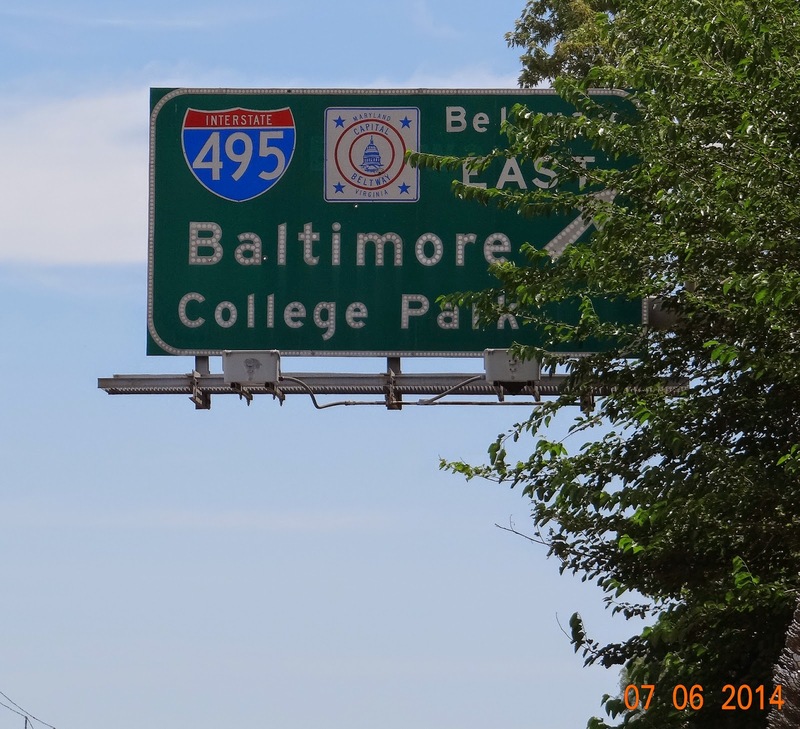 The large green signs on University Boulevard which advise drivers of the Beltway entrance ramps have been in use since 1964, making them 50 years old! Most other road infrastructure is replaced well before reaching that age (driving surface, guardrails and barriers, bridge decks, etc) but these signs have somehow not been replaced yet. It is not simply their age which makes them interesting. These signs are of a certain style that is leftover from a bygone era of highway design. This sign on eastbound University Boulevard is 50 years old. Sign photos courtesy of C. Patrick Zilliacus. The White Oak Shopping Center. I meant to post these a couple days ago, but I got distracted by the recent storm and another story I'm working on. Anyway, I got several pictures of the "super moon" last Saturday from a few different places in Four Corners. A super moon is a meteorological effect which causes the moon to appear very large and bright in the sky. I'm not an astronomer (though I did take one semester of Astronomy at DeMatha), so I do not know too much about this occurrence, but I do it looks really cool. I also got some neat pictures of the area at night, which I have also included, even if the moon is not in view. Since the moon was in the southeast sky, I was limited by what angles I could take pictures from, but I got some good ones. The next super moon will be some time in August, so there will be another opportunity for neat pictures then. The moon over University Boulevard at Whitestone Road. Looking west on the Beltway from University. No moon visible since this is looking in the opposite direction. The biggest concern Four Corners residents have about the White Oak Science Gateway Master Plan is traffic. Local civic groups in Four Corners have more or less condemned the plan because they do not want any inconvenience to come to local residents who get around by car. There are surely other reasons for their opposition to the plan, but traffic is clearly the biggest one. Many people think that any additional development in White Oak will result in an exorbitant amount of traffic congestion. No one likes traffic, and Route 29 is perceived to have terrible traffic, so when development is proposed anywhere near the road, some local residents immediately raise objections. These concerns arise because there is a common belief that more development = more traffic. Route 29 during the morning rush hour. The congested traffic farthest from the viewer is heading south towards the Beltway and Silver Spring, the empty lanes closest to the viewer are heading north towards White Oak. This photo showcases the imbalance of traffic on Route 29 during rush hour due to a lack of private sector employers in eastern Montgomery County. Photo by the author. I began to wonder about this correlation between development and traffic after I heard "traffic concerns" being used to justify opposition to just about anything new in or around my neighborhood. I also began to wonder about different kinds of development, since the types vary, yet I had never heard anyone distinguish between "good" and "bad" forms of development. Is there a way that the county can accommodate new residents (and grow the tax base, which benefits those who already live here) without making traffic horrible? Most Four Corners residents know that it's rarely a good thing to wake up to the news helicopter hanging out over the neighborhood for an extended period of time. This time, it was a building fire in Four Corners. Around 5:30 this morning, the Montgomery Fire and Rescue Service was alerted to a fire on the NW corner of Colesville and University, occupied by the Red Maple Restaurant, Authentic Peruvian Charcoal Chicken, 4 Corners Sports Pub, Free State Press, and various other small businesses, with smoke rising through the roof. Firefighters entered the buildings through the roof. White Oak Science Gateway Master Plan, Part 2: Why White Oak? As introduced in last weeks post, the White Oak Science Gateway Master Plan calls for dramatic changes to the community to our northeast. Anytime change is proposed, there is uncertainty, which leads to many questions. Many in Four Corners have raised concerns about the White Oak Plan, fearing negative impacts in the form of traffic and congestion. This has lead some to ask why these changes are being proposed at all, stating that "if it ain't broke, don't fix it". The White Oak Shopping Center. Photo by the author. The problem is that White Oak is "broken" in many ways. The area suffers from many socio-economic ills such as poverty, under achieving schools, and unemployment. This is not to say that White Oak is some awful place. The broader White Oak area includes many affluent and historic neighborhoods, such as Quaint Acres and the stately Burnt Mills Hills, which were both established in the 1930's. Hillandale, the community to the south of White Oak centered around the intersection of Powder Mill Road and New Hampshire Avenue, is also a very nice area consisting of estate style homes. There are numerous other subdivisions all around White Oak that are comparable to the neighborhoods in Four Corners. The White Oak Science Gateway Plan does not alter any of these established neighborhoods. The plan instead focuses on White Oak's commercial and industrial areas which surround the FDA's growing headquarters, officially known as the Federal Research Center at White Oak (FRC). Sign at the east entrance to the FRC on the recently built FDA Boulevard, a little-used 4 lane road that travels through Percontee's extensive concrete recycling plant. Most people in eastern Montgomery County are familiar with the residential and commercial areas of White Oak, be it the shopping center or the large apartment complexes along Lockwood Drive and Stewart Lane. These are the more visible areas of White Oak since they are close to Route 29 and New Hampshire Avenue, the two major roads in the area. However, the industrial areas north of Paint Branch (roughly bounded by Route 29, Cherry Hill Road, and the FRC) are much less visible to the general public. This is also the area with the most potential for redevelopment. The area of White Oak north and west of Paint Branch is mostly home to industrial and other commercial uses, with a pocket of residential development along Route 29 next to the park. Four Corners does the 4th of July right. 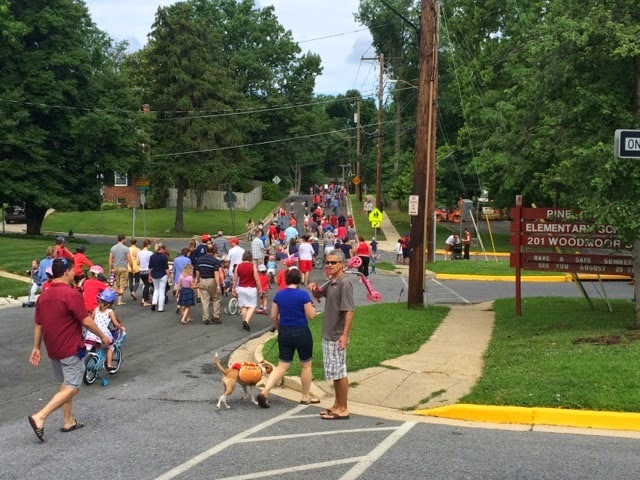 Our community does a great job of celebrating the 4th, through parades, BBQs and overall community spirit. 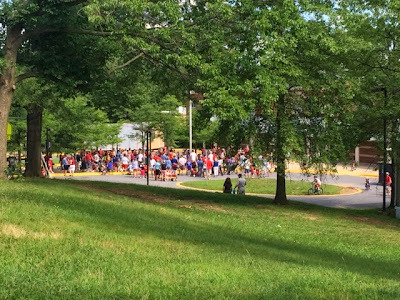 The Woodmoor parade is one of the biggest local events of the year, drawing thousands of residents together for a fun morning stroll. The parade has changed a bit over the years, but it remains one of the best events in the neighborhood. Woodmoor residents walking along Woodmoor Drive past Pine Crest Elementary School. I like holidays such as this because that draw out what makes our community great. The only other areas in eastern Montgomery County that have parades are Takoma Park and Burtonsville. In Woodmoor, a few residents placed American flags along the roads in and out of the neighborhood (Williamsburg, Saint Lawrence, etc). While this may be seen as a small gesture, it highlights how much people care about the neighborhood, and its one of those things that sets us apart from other communities. Events like this remind me of how fortunate we are to live in such a great place. 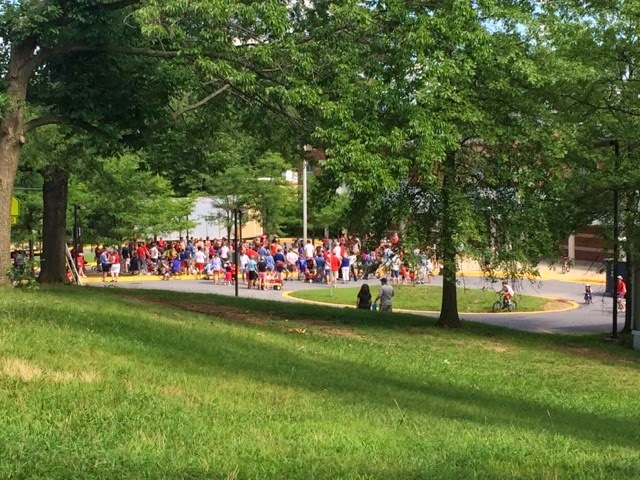 After the parade, people gathered around the flag pole at Piecrest to sing the Star Spangled Banner. 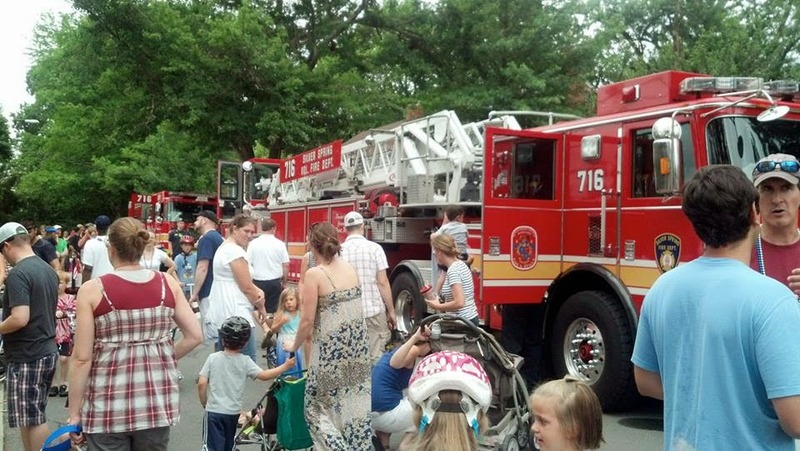 The firefighters from station 16 bring their apparatus to the parade every year for community outreach. The fire trucks are always a hit among the many kids who attend the parade (and several of the adults too). 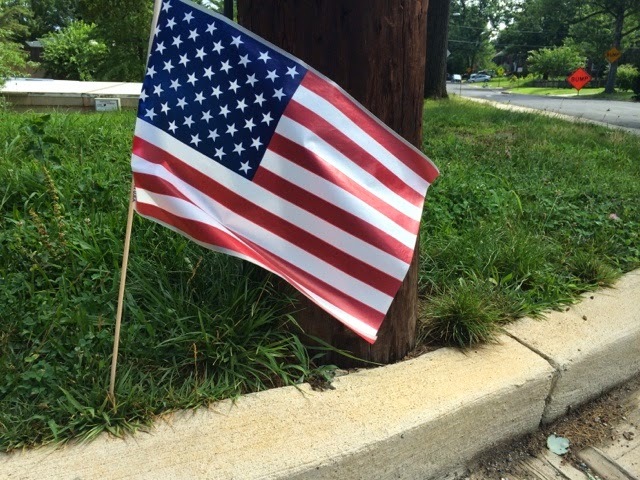 One of the dozens of flags placed around the neighborhood to display patriotism.